According to the route guide, it was supposed to be 13 miles. However, we ended up walking somewhere between 15 and 17 miles today. As we sit here in the family room of the B&B talking with a group the is going in the opposite direction from us, we are told that tomorrows route is not 14.5 miles, but closer to 16. Something to look forward to! We continue along the walkway, passing the Beeches – a beautiful brick residence tucked back into the trees. Passing the Beeches, we then crossed the M6 Motorway (finding another geocache). Leaving the highway behind, we entered the town of Linstock. Just passed Linstock, in Park Broom, the route was detoured away from the River Eden due to the mud and flooding. The detour led us along the road to Crosby-on-Eden. Walking along the Main Street, we passed the local pub (the Stag Inn), a Nursery (pre-school), the primary school, and the Church. This truly was the extent of the town! Mom stopped at the primary school to chat with some of the boys playing in the yard. The rest of us continued just past the church to find another geocache hidden in a gate. From here, we crossed into a farm yard, then over the A689 and along Sandy Lane. Sandy Lane was a track (yes, with some muddy areas), that led to the Roman Military Way. Reaching the Roman Military way, we had quite a stretch of road walking. We stopped along this stretch of road for “Elevensies” (tea). Along the Roman Military Way, we passed through a farm and then through a kissing gate large enough for two. Most of the kissing gates are just big enough for one person – and can be quite tight when you have a backpack on. Paul and Marielle had to stop for a smooch in the gate to prove that it was big enough for two! Into the fields we went, passing by Blea Tarn. This area was a low lying, wet area filled with reeds and bullrushes. The name Bleatarn (pronounced blitteren) means “blue pool”. From a distance, with the sun shining on them, the bullrushes do have a blue tint to them. We passed through another kissing gate into a tiny paddock, only to find an honesty refreshment box filled with snacks and cold drinks, to be paid for on an honesty system. Passing through another couple of fields, we passed through Oldwall, near Carlisle airport. Old Wall Cottage (in Oldwall), is a 17th century dwelling built from Wall-stone rubble. Passing the cottage, we walked along a narrow hedge lined lane, emerging into more pasture. The pastures took us to the town of Newton where we stopped for lunch at a picnic area on the town green, sitting with another hiker of Hadrian’s Wall. As we continued the walk, the path squeezed between a corrugated barn and a bungalow’s fence, ending up in the bungalow’s back yard and heading out to more pastureland. At Head’s Woods, we descended a flight of flagstone steps before passing another farm, through another field and down a steep bank to Cam Beck. (Just a note – there is another geocache at Cam Beck!). After crossing the footbridge, we ascended the flagstone steps to join a farm track. The track led across another field, then down through the woods around Sandsyke, where there is a B&B, as well as camping and a bunkhouse. Crossing another field, we entered the town of Walton. As we entered the edge of town, the skies became very dark and we had just enough time to don our waterproofs (put on our rain gear) before the rains started. This was the only rain shower that caught us while walking today – and fortunately, it was short-lived. By the time we had walked out of the town, the rains had stopped. From Walton, we had some road walking to do. We crossed Dovecote Bridge, where there was small section of the actual wall, that had been built with red sandstone. In 1983, this small section of wall had been unearthed for about 20 years and the weather had severely damaged the stones. At that time, to preserve what remained of the wall, much of it was re buried. We continued walking along the road through Lower and Upper Dovecote. At this point, the guidebook told us to “go up the steps and into a fenced passage – which might be muddy”. Might be is the operational word. There really is no “might” about it. From this point, we encountered many muddy areas that we had to pick our way across. But, we were coming to the end of our day. Passing through several fields and gates, we finally found the footpath that turned off the Hadrian’s Wall path and led to Lanercost. This footpath was actually a gravel road track and was one of the dried paths that we had been on for a while! 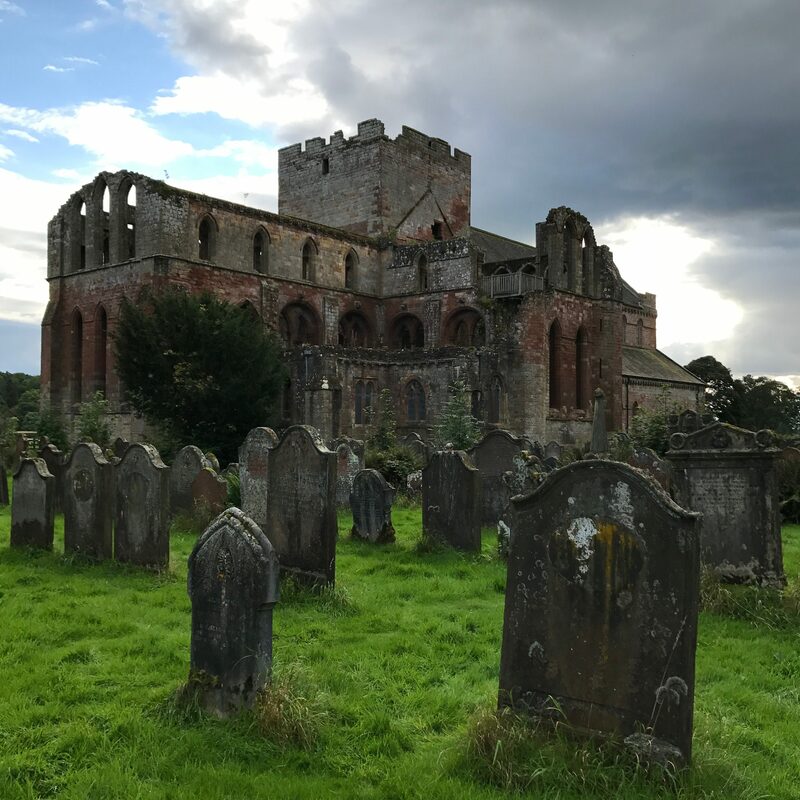 Part romantic ruin, part serene parish church, Lanercost Priory (‘Lanercost’ derives from the Welsh Llanerch, meaning ‘glade’0 stands within a parkland setting in the Irthing meadows. The walls of the priory were built unashamedly of plundered Wall-stone – from military device to the duty of God seems a fair exchange. The roadside wall fo the priory Garth is bounded by regular Wall-stone too. After crossing the Abby Bridge, a graceful bridge spanning the River Irthing, we found our B&B “Abby Bridge” and checked in. 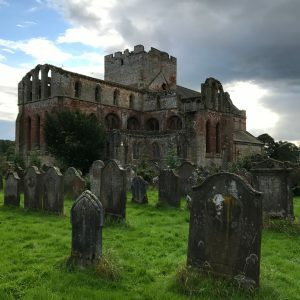 Mom and I headed directly back out to see the priory before it closed. Although in ruins, the priory is beautiful. The main transept of the Cathedral is still utilized as a church, but the High Altar and North and South Transcepts are without roof. The vestry, Chapter House, Cloisters and Dormatory are only seen by the foundations, but the Undercroft and warming room were still standing. It was very interesting to see some of the masons marks that still remained on the stone, as well as the huge fireplace in the warming room. The church yard was huge and it was quite impressive to stand among the gravestones with the Priory in the background. We returned back to the B&B just as the rain started again. A hot shower warmed us, and supper was served at the B&B family style. There are two other couples here with us tonight, also walking Hadrian’s wall, but in the opposite direction from us. Dinner was excellent, and it will be an early night for me tonight! To be honest, I am not sure where to even begin. The days are beginning to run together and I need to look back at the guidebook and at my pictures to even know where to start. The one thing that I do know: This is the first day that my waterproofs didn’t even come out of my rucksack. The last mile that we walked, as I was watching the dark clouds move in, I thought “it hasn’t rained on us today”! Less than one tenth of a mile from the Inn, the rain started! Instead of reaching for the rain jacket, I just ran! Of course, as soon as we got settled, the rain had stopped and the skies cleared again. Another thing about today – its the first day that we actually saw some of the wall! We passed Milecastles, turrets, forts, and large areas of the wall. The history of Hadrian’s wall is actually quite fascinating. The Roman army started building Hadrian’s Wall in AD 122 and may have completed the tack in under ten years. It crossed the island of England between Wallsend and Bowness-on-Solway, marking the north-western frontier of the Roman Empire. Emperor Hadrian Amelia’s had come to power in AD 117, inheriting a volatile situation at the northern edge of his empire. After failed attempts to conquer Scotland under Governor Agricola, Rome had established a frontier road between the Tyne and the Solway Firth; two important forts at Cobridge and Carlisle had been linked by road (the Stanegate), with additional forts being built along its east-west route. The Stanegate was replaced with a physical barrier – a defensible line of control that interrupted the erratic movement of the Pictish tribes which so troubled the Romans. For over 300 years, the wall was the focus of life for those stations upon it and those living alongside it. Over the centuries the requirement for farmland led to the Wall’s destruction by the ploughing. Today, only a portion of it remains visible – mostly in the central sector – and much of that was restored in the mid-10th venture or consolidated between the 1930s adn 1980. Let’s see if I can start from the beginning of our day. We left Lanercost Priory (ad our B&B Abby Bridge, by the Abbey Bridge) and hiked uphill into Haytongate, where we rejoined the trail. The trail continued uphil through a sheep field, up Craggle Hill (the name means hill frequented by cranes). At the top of the rise, the views were fantastic. We could see from teh Pennines in the south to the Langholm hills in the north. As we skirted Hare Hill farm, our first glimpse of the wall came into view. At Hare Hill stands the tallest portion of the wall we will see. As we continued walking, we followed a lane and came to the town of Banks – whose name means “up the banks from Lanercost”. Across the field from Banks is a woodland called Noble Hott, where a Roman limekiln was. Along the road outside Banks, we passed many turrets, as well as Pike Hill Signal Tower. The turrets lie exactly one third of a Roman mile apart; measured by 333 double steps (Roman marching paces). We reached Comb Crag Farm and decided to continue along the road instead of through the fields. This would mean missing Combe Crag ridge and gorge, with evidence of a Roman quarry – but we would see another quarry later in the day. We re-merged with the trail at Birdoswald Roman Fort. Birdoswald Estate is a grime example of how the Saxons and others reverted to timber as the primary building material, and used the Roman Walls int eh sidestep sense as the basis of settlement and farm estate boundaries as well as building. Behind the fort, we stood above Irthing gorge, with the curling thread of the river far below. From Birdoswalk Estate, you could stand and see the Walltow Crags due east – where we would be walking later today. The path rains along a stretch of Roman wall, up to Milecastle 49 on Harrow Scar. The track then turned down hill along a flagged path, crossing a river and coming to the Roman Bridge abutments. It seems strange to see the bridge abutments in the middle of a field – showing how much the river have moved since the original Stone bridge had been built. When the bridge was destroyed by flooding, a wooden bridge was then built. The idea was that the flood waters would be able to flow around the wood more easily, and would be easier to replace. Eventually, a more substantial stone bridge was rebuilt, large enough to support a road across the bridge. We followed the wall up a flight of flag steps to Willowford Farm, were there was a centuries stone that had been placed in the wall of the barn. Centurial stones were a common feature of the Wall. They were inserted every 45 ft as a form of hallmark device to confirm the proper completion of a section of Wall under the stated centurion. We continued following the wall across farm lands, passing several more turrets along the way until we reached Gilsland. Passing through Gilsland, we came to another Milecastle, which is also known as King Arthur’s Stables – a classic example of how folklore and old ruins intermingle, with names based on fable rather than fact. Leaving Gilsland, we walked through The Gap, where we stopped for lunch on the grassy slopes, surrounded by sheep. 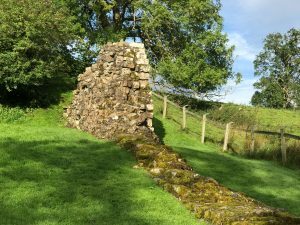 Following the gap – a Wall ditch with the Wall on one side and the bank on the other side – we walked past several farms, eventually coming to an area where the Hadrian’s Wall path converges with the Pennine Way. We passed Thirlwall castle ruins. It was a 14th century castle, its name meaning “hole in the Wall”. Paul and I walked around the ruins before moving on and catching up with the group. The path led past a few homes, then ascended up a pasture. From the top, the wall ditch and path is quite evident, and an imposing sight. We continued across the pasture, ending up a Walltown Quarry – a Roman quarry at the foot of Walltown Crags. Climbing to the top of the crags, we then spent the next few miles walking along the edge of the cliffs, descending into gaps, then climbing the ridges again. Some the ascents (and descents) were very steep and we were lucky that stone steps helped us along the way. At one of the gaps is the site of King Arthur’s well. This is a spring associated with the baptism of King Edwin who ruled int eh early seventh century. Mucklebank Crag, the highest part of this ridge has some of the best views. The path comes to an end along the ridgeline and enters a pine forest in front of Cockmount hill, and leading into Great Chesters, another Roman Fort. Beyond the fort, we followed the path back into pasture land to Cawfields Crags and Cawfields quarry. Passing though some more pasture along the Crags (read many ups and downs), we come to a road, and with with dark clouds moving in, made a decision to leave the crags and follow the road the last mile and a half to the Vallum Lodge in the village of Twice Brewed for the night. This ended up being a great decision because, as I mentioned earlier, it began to rain just as we made it to the Lodge. It ended up being a long – but great day. My pedometer read 17.9 miles completed by the end of the day – extra walking around the forts, turrets, and castle ruins. Also some geocaches completed and some not found. My feet an legs are definitely tired tonight! ** Most, if not all, of the historical information comes from Cicerone’s guidebook, “Walking Hadrian’s Wall Path” by Mark Richards.